UH's P.J. 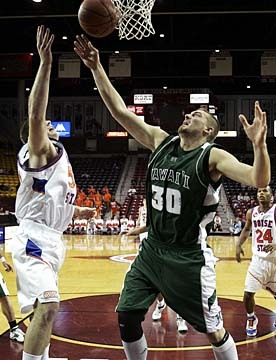 Owsley pulled down a rebound over Boise State's Kurt Cunningham during yesterday's tournament loss. LAS CRUCES, N.M. » The Western Athletic Conference may look off campus when the time to pick a site for the league's basketball tournament rolls around again. The tournament has been held at on-campus arenas for all but three of its 25 years. After two years at New Mexico State's Pan American Center, it's headed for the Lawlor Events Center in Reno, Nev., for the next two. But holding the event outside of a WAC town could be in the tournament's future. WAC commissioner Karl Benson said the Orleans Arena in Las Vegas contacted the WAC about possibly hosting the tournament and Salt Lake City was a close second behind Reno in the last vote. He said representatives in Sacramento, Calif., have also expressed interest. "There's always going to be advantage-disadvantage in terms of the site," Benson said. "I think as we go into the next cycle we'll continue to seek a site that may be more neutral. "I think we have some options, but we can't ignore the type of environment and atmosphere a campus community provides." Benson said Hawaii submitted a bid to host the basketball tournament in the 1990s. But along with the financial burden, the logistics of getting teams back to the mainland for postseason tournaments work against UH if the school were to pursue the tournament. UH will host this year's WAC softball tournament and the volleyball tournament in the fall. Benson said there are no current talks with ESPN regarding the league's television contract. The negotiation period begins in April 2009. He said there have been "discussions" about extending the contract that runs through the 2009-10 season the last two years, but the league and ESPN couldn't agree on the financial terms. "I'm confident the WAC and ESPN will be partners for a long time," Benson said. Bobby Nash's 5-for-5 showing from the line yesterday gave him the UH single-season record for free-throw shooting. Nash ended the season at 87.9 percent (80-for-91), to edge Chris Gaines (87.4 percent) out. Although Hawaii was the first school to be eliminated from both the men's and women's tournaments, the teams won't be jetting home just yet. The lack of available airline space means the Hawaii teams will be in Las Cruces until Sunday.